Can you imagine of anything wore than the German subjunctive 2? Exactly, the German subjunctive 1! Although you might like to start crying right now, hold on. 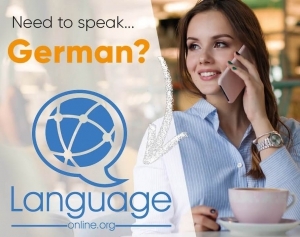 Language-easy.org will help you to learn everything you have to know about this type of German mood. So, in the following, we will have a detailed look on the correct usage of the German subjunctive and, of course, explain what we are actually talking about. After that, we will dedicate our attention to the conjugation of the German subjunctive 1. Finally, I’d like to present you a table in which you can see the correct use of the German subjunctive 1 in the different German tenses. By the way, there is an article on Wikipedia which could provide you with some background information about this topic. And now, let’s not use too much time and come straight the definition and the usage of the German subjunctive 1! Well, let’s start with the easy part. 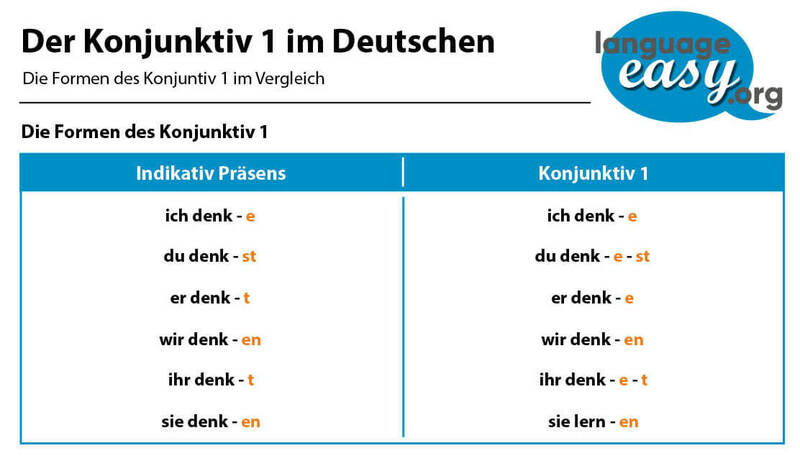 So, let’s try to define what the German subjunctive 1 actually is! Please, keep in mind the following description if this grammatical term. The German subjunctive 1, also called special subjunctive or present subjunctive, is a grammatical mood which expresses a way of speaking that allows people to express their attitude toward what they are saying. So, in this case you can find the German subjunctive 1 especially in newspaper articles and reports. Here, when statements are repeated as indirect speech. Additionally, you can find this type of subjunctive in special idiomatic expressions. First, the German subjunctive 1 is in the indirect speech. Second, you can find this subjunctive in some idiomatic expressions. Congratulations! Well, you have passed the first and rather easy part of this article about German subjunctive 1. Now, let’s go on to the conjugation of verbs in this mood. So, before we come to the conjugation of the German subjunctive 1, we have to consider some important points about this topic. Of course, these points are not of essential importance. Nevertheless, they can help you the make your use of this German mood even better. First, you should consider that only the verb “sein” is still common in al its German subjucntive 1 forms. Second, the German subjunctive 1 forms in the 3rd person singular are normally used with all other verbs. So, we only have to remove the “n” from the infinitive forms. Third, you should keep in mind that in the 2nd person (singular -“du” and plural – “ihr”) the only difference between the subjunctive 1 and the indicative is that there is an “e” before the ending on the German subjunctive 1 form. Fourth and last, it is important to know that there is no difference between the German subjunctive 1 and the indicative forms in the 1st person singular and 1st and 3rd person plural. So, we have to use the form of the subjunctive 2 instead. So, now we have cleared up these points about the German subjunctive 1. Well, I think we are ready to come to the conjugation of verbs in this mood. Well, you can use the German subjunctive 1 in the following German tenses: The present, the present perfect and in the two future tenses. Well, let’s illustrate these forms in the German subjunctive 1 mood with some examples. So, first, let’s have a look at some examples for the present tense. “Philip wünschte, dir helfen zu können.” – Philip wished d to help you. “Der Hund sei kein Welpe mehr.” – The dog is no longer a puppy. “Gerne schlafe er im Keller.” – He would love sleeping in the basement. “Der Hund sei gestorben, weil sie ihn im Auto vergessen hat.” -The dog died because she forgot it in the car. “Er sei krank geworden, weil die Klimaanlage zu kalt gewesen sei.” – He got a cold because the air condition was too cold. “Sie werde dieses Jahr abnehmen.” – She will loose weight this year. “Er wird ab jetzt keinen Alkohol mehr trinken.” – He won’t drink any alcohol from now on. “Ich werde das Gemälde vor April vollendet haben.” – I will have finished the painting before April. “Er wird das Projekt bis nächsten Donnerstag fertiggestellt haben.” – He will have finished the project until Thursday next week.